Ok, I can't take it anymore. There is a blogger - a good blogger, the creator of Momastery - the blog. Well, She has written a book. A book I want so desperately to finish but after this last chapter (Treasure Hunt), I can't. I have really enjoyed her realistic views on raising a family, overcoming alcoholism and her funny - snarky stories of motherhood. Great. She is a Christian. And don't get me wrong - I am not being prejudiced against her will and want to believe in God and Jesus and all the tales of the Bible. No, that's not it. In this chapter she continued with a very naive response to the Buddist practice of Zen. That it's this careless, flippant response to the horrors of the world. That this thing called 'transcendence' is just some sort of quant field trip from reality. She's obviously never read Siddhartha, or hasn't read it closely enough. I am not a Buddist, but when I don't understand something completely - I don't automatically attach a negative, self-riteous (false) meaning to it. Again - I am sure she is a very fine person with her very Christian (very protestant) views, and that these biblical lessons have aided her through motherhood and her own suffering - fine, but I just can't read anymore. Not after that. I am an atheists and have read quite a bit about religion and eastern philosophy finding my own way. I don't subscribe to anything, it's a choice I have made. I would never make the accusation that Ghandi's suffering in transcendence, his practice of Zen - protesting violence and war was him just being 'out of touch'. 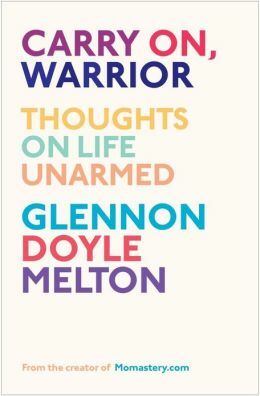 Sorry Glennon Doyle Melton - I just couldn't finish your book, but thanks for sharing.